Here is an unusual and most needed book. For many interested in ceremonial magic the greatest obstacles are the inconvenience and impracticability. For many lack both the privacy and the time to perform - often - convoluted, rituals. Then there is the expense of ritual paraphernalia which sometimes can run into costs of hundreds. Most occultists and the writers of books on magic seem to think that there are no such obstacles, that performing magic is like every other normal daily function. For many this can never be so. THIS BOOK PROVIDES  AT LAST  A PERFECT SOLUTION. THE PRACTICE OF CEREMONIAL MAGIC IN ONES HEAD. Everything is to be imagined. This provides the reader with the ultimate privacy and the ultimate convenience. But how can such magic be possibly valid? This is to ask the wrong question, for the author asserts that all magic originates in the mind anyway. The props of magic are aids and conduits for what happens in the practitioners mind. This does not mean that the paraphernalia is irrelevant. It is relevant  the difference here being that it can all be imagined in lieu of the physical objects themselves. 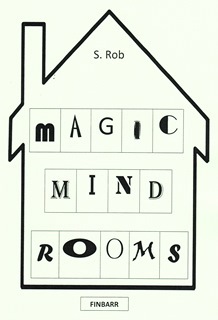 In his book, Magic Mind Rooms, the author suggests that the reader can create a room for magic in his own imagination only. In this room anything can happen and all the paraphernalia is imagined. The altar is imagined, the candles are imagined, the sword or chalice is imagined, and so on. THERE IS NOTHING INFERIOR TO THE REAL THING, FOR THE ACTUAL MAGIC ITSELF IS HAPPENING IN THE MAGICIANS CONSCIOUSNESS. Yes, it is make believe  but creative make believe. This can benefit the reader enormously. Those who feel they cannot imagine or visualise need not fret. For this is not hard mental work  on the contrary, it can be great fun. Indeed one can find that ones imagination takes on a life of its own. We are continuously using our imagination, whether we realise it or not. In Mind Magic Rooms the author is suggesting that we channel this involuntary use of imagination towards a constructive, purposeful end. As every occultist knows, whatever is purposefully imagined takes on a reality of its own. It becomes an astral form. Most imaginings of the mind are wasteful, for they have no aim or purpose. The beauty of Magic Mind Rooms is that one is not bounded or inhibited. IT ALSO HAS THE POTENTIAL TO BE MORE EFFECTIVE THAN THE PHYSICAL EQUIVALENT BECAUSE ONE CAN REPEAT IT OFTEN. One doesnt have to wait for when it is convenient or when privacy is available. All is possible in the realms of purposeful imagination. It is also fun because the imagination adapts and responds naturally to the concept of different rooms for different things. In such mental magic ones options are boundless. One room can be dedicated to a particular type of magic and another for a second type, and separate rooms can each be dedicated to a specific objective. These rooms remain distinct, each functioning for the purpose for which they were created. Animal sacrifice  an abomination to the civilised mind  is a feature of many physical rituals and unlikely to be tried by most. But in the imagination it can happen and serve the same magical purpose as if it happened in real life. This is still something many may not want to pursue even in imagination, but it is an example of the convenience and practicability of this alternative. It is in truth no alternative at all, for this is the ultimate' magic in so far as consciousness is being manipulated to bring about a certain effect. Another advantage lies in the area of divination. Yes, you can divine without using a crystal ball, cards, or any of the usual physical artifacts of divining. It is in fact easier this way. For example, an imaginary crystal ball is more likely to yield up an image of the future than an actual one. Through Mind Magic Rooms you can be shown your personal totem animal. Its identity is revealed when it steps out to greet you. Everyone has a totem animal: a particular species which acts as a spiritual guide. With this method you can discover the animal that will be both your guide and protector. The book shows how to create a servitor, a willing, obedient, astral entity whose job is to materialise in the physical world the thing that you want. If it all seems improbable it may be because you have not tried it before. In any event, the process described in the book is more potent and its practitioner will be astounded by just how much power it generates. So potent is the concept behind Magic Mind Rooms that it is, explains the author, the secret psychological device used by military personnel captured by an enemy. How does one mentally process, deal with, or otherwise thwart, torture? Find out here. The applications for Magic Mind Rooms are without end. They can be applied for the fulfilment of any goal, or simply for general good luck. Specific rituals are given for s p e c i fic ends (e.g. a better career, defeating the Evil Eye, etc. ), but they can be employed for any task. In these rooms you create your own candles, your own talismans, circle of protection, and so on, all of which are as equally magically valid as the real thing. Moreover an immediate practicable application is for the rapid improvement in ones memory. You will be able to remember long lists of items, numbers, dates, with complete and perfect ease. This is wonderful! So easy, and it works just like  magic!